Beyond the sparkle of the College's Christmas celebrations, a quiet tradition allows students and faculty to give back to the Saint Peter Community. The Holiday Angel Tree sits outside the Community-Based Service and Learning office. For over a decade, Gustavus has participated in a quiet holiday tradition. The Holiday Angel Tree sits in the Johnson Student Union outside of the Community-Based Service and Learning (CBSL) Office. Instead of ornaments, the tree is adorned with small pieces of paper. On each tag, there is a gift request made by a child in the Saint Peter community. Any member of the Gustavus community is welcome to pick up a tag, purchase a gift, and return it to the CBSL to be donated. Through a partnership with Head Start, an organization promoting school readiness for low-income families, these gifts are given and received anonymously to meet a need this holiday season. 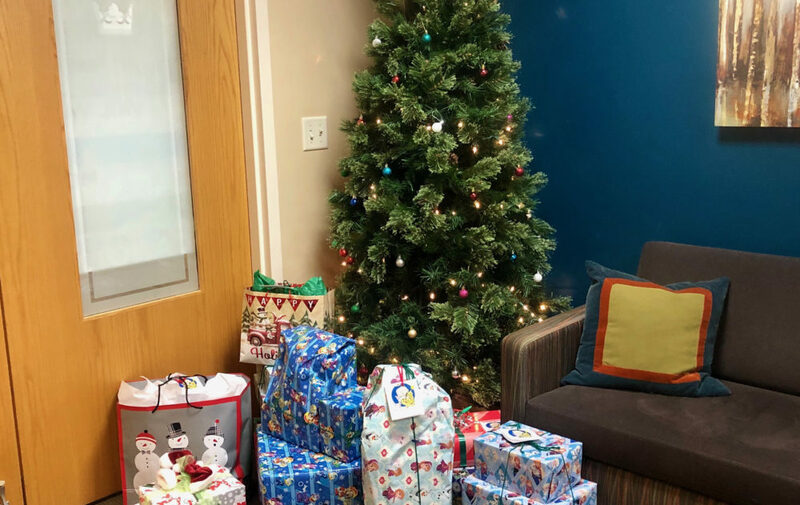 Every year, all of tags get taken, but this year Amy Pehrson, the Director of the CBSL Office has been impressed by the great response to the Holiday Angel Tree. All 92 tags have been removed from the tree and the gifts are starting to roll in to support 40 local families. “What I love about the Holiday Angel Tree is that students certainly pick up tags, but faculty and staff always look forward to it too,” said Pehrson. Not only the Gustavus community, but Saint Peter community members also get involved with the Holiday Angel Tree. Women’s organizations from Saint Peter often donate mittens that can be added to the gift. The Holiday Angel Tree is one of many ways that Gustavus partners with the Saint Peter community. “The CBSL Office connects Gusties with the Saint Peter school system, the elderly population, the local pound, and sometimes even local farmers just looking for some extra help,” said Pehrson. With the help and guidance of the CBSL office, there are nine student organizations on campus that are dedicated to meeting needs in the Saint Peter community. Holiday Angel Tree gifts can be returned to the CBSL Office with the tag, wrapped, and ready to go by December 12. For those who did not grab a tag but would still like to participate, any additional donations are welcome.